So… I have to issue a clarification. 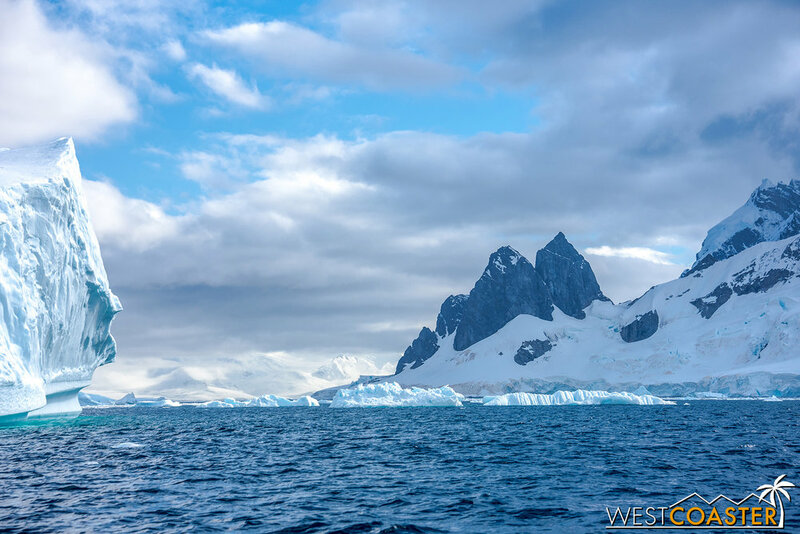 The last time I wrote about these parts, I mentioned that it was the last stop in Antarctica. And it was, but it wasn’t the last post about my trip. This one is. 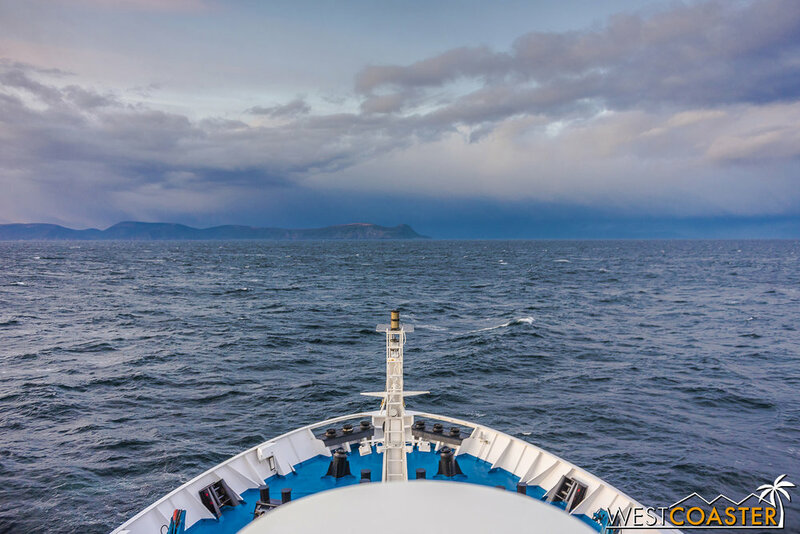 It covers our cruise back across the Drake Passage, returning to our port in Ushuaia, Argentina, and also delves into some information that I hope will be helpful should any of you ever be inspired and fortunate enough to such a journey in the future. So one last time, prepare yourself for a land of ice and shadow and polar wildlife, as we take on the conclusion of Albert’s Antarctica Adventure! Looking southward at the continent falling away behind us. Our departure from Wilhelmina Bay occurred mid-afternoon, a little sooner than the ends of our other PM excursions. With the unpredictable Drake in our frontview and many passengers depending on being able to fly out of Ushaia the day that we were due to return, time was certainly of the essence! I spent a lot of the afternoon out on the deck of our ship, the Ocean Diamond, watching the peaks of The 7th Continent drift away. Even at a receding distance, they were majestic and impressive. The vista was a monumental final image with which to leave Antarctica. And I must I admit… I did get a little sentimental reflecting on our past four and a half days in this rugged, pristine wilderness. It had been a life-altering experience—one that I know I was exceptionally fortunate to experience. The sun begins to set in the west. Shadows of the South Shetland Islands. The silhouette of the peninsula and a few of the South Shetland Islands were still visible as the sun set. They would no longer be so the following day. Although our exploration adventures had concluded, the crew at Quark Expeditions still kept us busy. Over the course of the next two days at sea, there were plenty of classes to help reinforce the experiences and sights we had witnessed, from follow-up seminars on Antarctic wildlife, fish, and birds to additional insight on the history of Antarctic exploration to lessons on photo editing and honing our best shots taken on the trip. A rainbow at sea—what an amazing sight! Outside, we were still treated to the occasional feast for the eyes. Once again, we spied local avian species taking flight around us. Wandering albatross, Antarctic terns, and Southern petrels were frequent sights, swooping and arching over the waters of the Drake. And the skies put on a show too. On our second afternoon, we spotted a distant rainbow beneath some moody, gray skies. The following day’s sunset was a heavenly one, with the sun finally breaking through the clouds as it reached the horizon, blazing warm sunbeams onto the harsh, unforgiving sea. Sunset on our last day at sea. By the time we approached dusk of our final full day of our trip, land was once again in sight. Ahead of us, due north, we could see the very tip of Chile and South America, and the beginning of the rest of our journey home. A crimson and violet post-sunset to the west sent us one last spectacle of nature, bidding a fitting farewell to the exhilarating journey we had taken over the past nearly week-and-a-half. Before darkness, we were once again sailing up the Beagle Channel, splitting the waterway between Chile on the left and Argentina on the right. Our final night’s dinner was the grandest of all—a surf and turf four course feast that celebrated the bittersweet end of our journey. The night was spent celebrating with our newly made friends during the whole expedition. And by the time dawn began shining it’s first rays, we had returned to Ushuaia and docked at the same port from which we’d left nine days prior. Glimpsing South America straight ahead! A beautiful way to close out our last day onboard the Ocean Diamond! If all of this has inspired you to perhaps try for a trip toward the South Pole yourself one day, you might be wondering how an adventure of a lifetime like this comes together. It all starts out with selecting an Antarctic tour operator. Tourism in Antarctica is strictly monitored and controlled by the International Association of Antarctica Tour Operators (IAATO) under the provisions of the Antarctic Treaty. 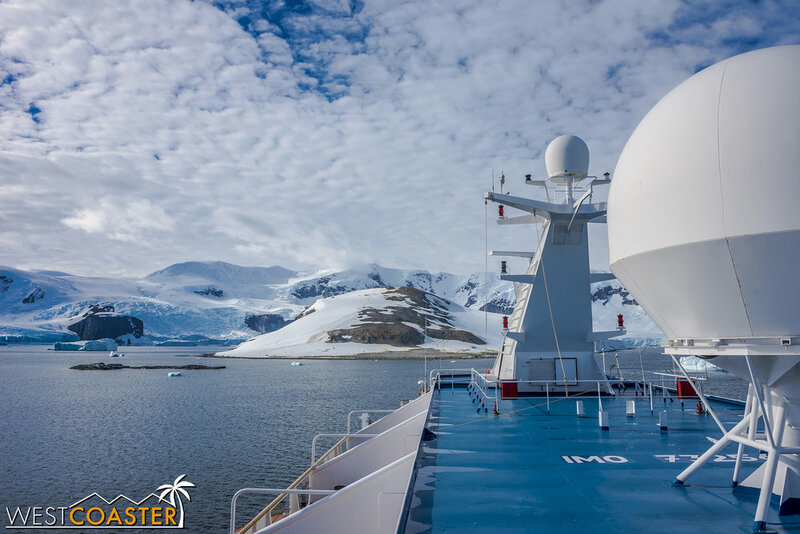 That effectively means that, unless your are a research scientist or special political official, if you want to go to Antarctica, you need to book a cruise with a registered company or entity who will act as your guide. With my trip, my friend who was the original impetus had already done some research prior to inviting me, and our choice ended up being Quark Expeditions (note: this is an unsolicited plug; they are not paying or asking Westcoaster to make the statements and endorsements in this post). One of the first criteria we looked at was the tour size for each cruise. Antarctic Treaty dictates that only one hundred people can be on land at any particular site in Antarctica at any particular time. This meant that, ideally, our cruise ship should accommodate no more than two hundred passengers in order to maximize the number of sites we could visit and time to visit each. 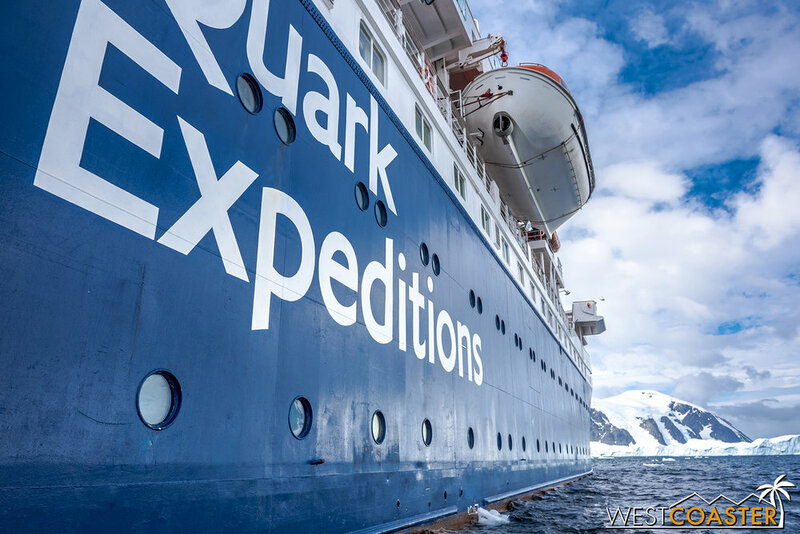 Two hundred passengers would allow half to go on land during a particular site visit and the other half to cruise the waters along the coast, then flip—which is exactly how our Quark Expedition tour format played out. Of course, one could apply the principal with more people—two groups of 100 each cruise the waters while one group goes on land for a ship of 300 passengers and so on, but that would cut into the time on land, since there would now have to be more groups accommodated in the same amount of time. Or there would be less overall sites visited, if more time had to be allotted per site. The Ocean Diamond docked at the main port in Ushuaia. Now, with a cruise designed for only 200 guests or less, one might think that the resulting vessel wouldn’t hold up to that of a traditional ultra-majestic cruise liner, but that was not the case. Though I had never done a cruise before, friends made along the trip told me that this adventure provided every bit as much of the same types of amenities as a regular cruise ship—just on a smaller but uncompromised scale. For the past week and couple of days, the Ocean Diamond had been our floating home—a place to unpack and unwind and enjoy the breaks between excursions. Holding only 189 passengers, with another twice that amount for ship crew and staff and expedition guides, this ship was both intimate and grand. With seven decks (and passengers occupying five of those levels), our ship accommodated a variety of price ranges, from cozy but efficiently laid out triple cabins to lavish balcony suites overlooking everything below. 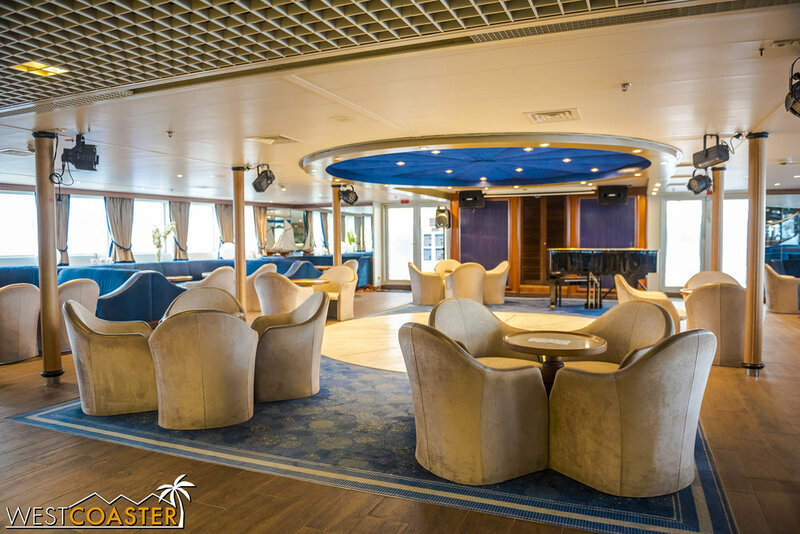 The “Main Lounge” inside the Ocean Diamond. What we really enjoyed about our ship was its combination of speed, comfort, and size. For a cruise ship, it was definitely small—a “superyacht” more than anything. 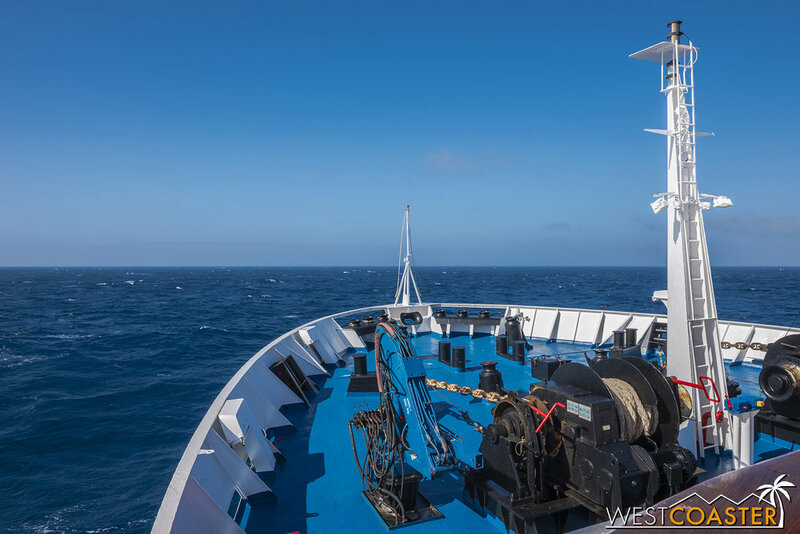 But it was still large enough to ride out the wakes in the Drake Passage, yet maneuverable enough to chase the orcas we encountered in the Ferguson Channel and slip through the narrow pinchpoints of the Lemaire Channel and Deception Island with ease. And it had all the ammenities that one would expect from a cruiseliner—a great dining hall boasting an internationally diverse and delectable menu that changed daily, a full service bar, a main meeting space, several deck levels, a reading room, a gift shop, observation bridge, and even its own (small) gym. Though I’m normally not interested in cruises due to their strict itineraries, I could definitely understand the appeal that they brought to those who wanted a stable home base with “greatest hits” tours of a particular region. It was nice to have over week of not having to worry about packing up to move onto the next destination. Standing on the bridge with the crew. The Ocean Diamond had an open bridge policy, with exceptions occurring only in case of urgent affairs needing immediate captain and crew attention and focus. We were also blessed with an enthusiastic expedition staff made up of a global adventurers who shared a passion for exploration and ecological stewardship. Whether they were historians or marine biologists ornithologists or photographers or ecologists, the common love for this planet and its many, incredible features ensured that their zeal was broadcast into their excursions and tours, as well as their stories and lessons. Quark Expeditions was an early pioneer of polar tourism, and they have certainly made sure that their employees espouse the same environmental stewardship and curiosity as their company values. Our fantastic Quark Expeditions guides and excursion leaders. The crew of the ship also worked tirelessly each day to keep operations running smoothly. Zodiacs were promptly unloaded into the water the moment the Ocean Diamond laid anchor, and they were just as quickly swooped up when it was time to go. The bountiful service staff—many from South and Southeast Asia and the Pacific islands, plowed though long hours starting early in the morning and often ending late at night to make sure all passengers had their needs met. From the housekeepers to the servers and waitstaff, these unsung and invaluable members of the boat became friends during the course of our stay, making the excursion feel more like one giant family vacation than a collection disparate travelers. Loading Zodiac rafts at the aft. All of this came at a price much cheaper than any of us expected. Once upon a time, I had a dream to visit all seven continents of the world, but I had always told myself that I’d be satisfied with six, since Antarctica seemed like an uber expensive pipe dream. And make no mistake, our trip with Quark Expeditions was pricey. The total for our 11-day tour (which was really 9 days on the boat, 8+ at sea, and 4.5 days of actual Antarctic site visits) plus the overnight camping add-on was about $7,700. If you had asked me what I thought it might be before any research, I would have guessed three times that amount. It also didn’t hurt that our single-bay triple cabin was surprisingly upgraded for free to a two-bay suite, doubling the amount of room (and bathrooms) that the three of us had. If you’re still interested in trying to make a trip to Antarctica one day, though, read on. I’ll go over some common topics that come up for people who have an interest in such an adventure but no idea where to start or how to go about planning and preparing for such a voyage! The scene from Danco Island. The first thing one needs to know about making plans for The 7th Continent is that early, early planning and booking is almost an absolute must. Tours typically fill up a year in advance, and although there are sometimes deals to be seized late in the game, just several months ahead of an actual trip, because another passenger has dropped out, by and large, one needs to make a reservation 10-12 months in advance, minimum. Remember that Antarctica is in the southern hemisphere, and tours occur during its warm months—i.e. November through March. Going earlier in the season will offer more opportunities to see more pristine land, before the tourism traffic and warming of the ice sheets produce “dirtier” imprints on the land. But it will also feature less wildlife. Wildlife is plentiful from December through early February. January is an especially great time to see penguin chicks, and there will be plenty of whales and seals as well. This is also the warmest time of the year, with temperatures tipping over the freezing point. 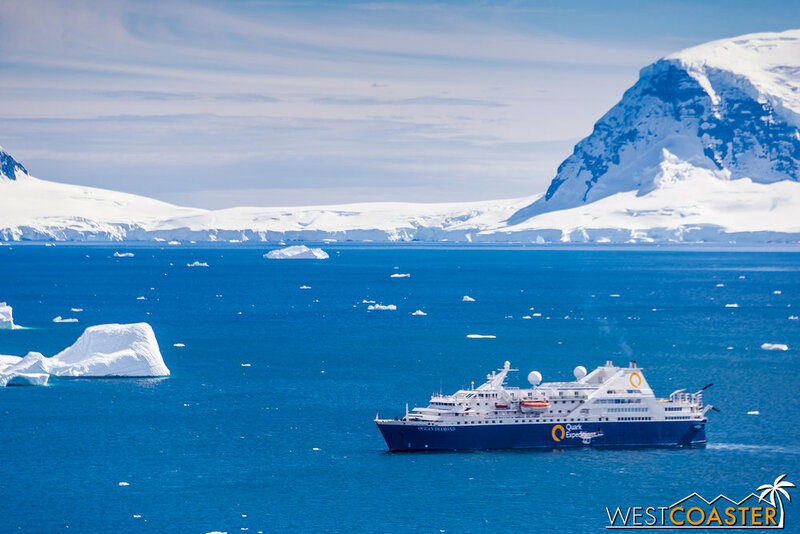 But during this peak, Antarctic tourism is also at its busiest, so there may sometimes be competition for site landings, and your cruise may not happen to always get the most optimal sites. By the time late summer comes in March, whales will be very plentiful, but many sites may be muddy from melted snow, and penguins will be mostly seaborne rather than on land. Based on my own trip and the feedback from other friends who had visited Antarctica before (not to mention Quark themselves), if I were to recommend an ideal time to visit, I would say January would be best. The weather is typically the mildest during this time of year, and it features a great mixture of wildlife. It’s the best balance of all attractions, in my opinion. Penguins and penguin chicks on Danco Island. When we booked with Quark, we had a travel agent who helped answer all of our questions, provide us with trip planning advise, and negotiate and remind us of the steps needed. I imagine other tourism operators are the same. You can browse the IAATO directory for a list of all operators. Booking involved making an initial deposit of just over a thousand dollars, then paying the balance of our cost in September, four months before our trip. This helps break down the wallet hit a little bit, and the initial deposit is mostly refundable if the trip is cancelled before the second payment is due, but that second payment was still a bit of a financial strain that I had to plan around. A view of our tiny island home for the night of our overnight camping excursion in Leith Cove. Trip delay, interruption, or cancellation (weather can create delays, premature end, or even cancellations of whole cruises, and there is no way to predict when or if this might happen, even during the more typically calm summer months). Look for 100% coverage of all travel, lodging, and tour costs for trip cancellation and 150% of the costs impacted by trip interruption. Medical coverage (this covers the cost of treatment in the event of a major injury). The tour operator should state a minimum amount of medical coverage required (Quark told us $50,000). Medical evacuation (there are no hospitals or ambulances nearby in Antarctica; in the event of a serious injury that requires hospitalized medical treatment, getting out of Antarctica will be very time consuming and very expensive). it typically costs at least $100,000 to evacuate a person from Antarctica, so keep that in mind! The policy that I purchased covered half a million dollars for this. Repatriation (morbid, but if you happen to die while in Antarctica, it will be very expensive to recover your remains, and your family should ideally not have to cover that). This should be covered as part of the medical evacuation coverage. Baggage issues (most people will be coming a very long way just to reach Ushuaia, Argentina or Punta Arenas, Chile—the traditional departure points for Antarctic cruises—and given how one needs to pack for this type of trip, any baggage that is checked could very well get lost). The standard amount is typically $1000 for lost or stolen luggage, but many people may also be coming with expensive camera equipment or gear that will greatly eclipse that amount. Tally the value of these items and factor them into your policy! On-shore and off-shore activity (carefully confirm if the policy becomes void in the event of incidents arising from certain “higher risk” activities—such as rock climbing or scuba diving or camping or kayaking or skiing. Pre-existing waivers (most policies will say that if you develop a condition outside of a certain amount of days prior to the trip, it will not be covered, as it was “pre-existing” and occurred early enough to allow you to reasonably cancel and get your money back through the operator’s policies). 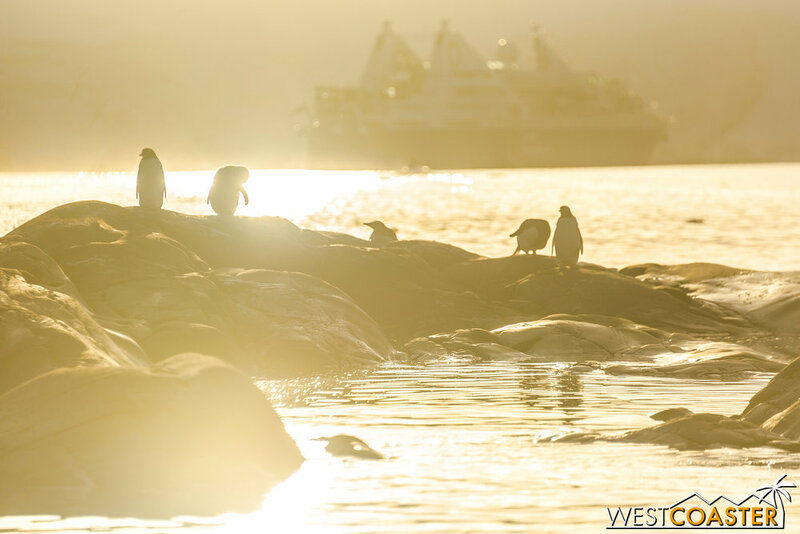 Penguins soak up the afternoon sun in Leith Cove. When visiting Antarctica, the cliche “expect the unexpected” most definitely applies. It is a mantra in these remote and rugged parts. Future Antarctic explorers should anticipate that anything can happen—including nothing. And by that, I mean that local weather conditions could actually result in the complete cancellation of the trip. This is highly, highly unlikely, but it is technically possible, and it is why that travel insurance is so important. Post-sunset over our Antarctica camp-out. Aside from the doomsday scenario imagined above, there are plenty of more realistic possibilities that could detract from the full experience of a trip. Weather may cut a trip short, resulting in an early finish to a particular excursion, day, or voyage. High winds may prevent landings from occurring if it becomes to hazardous to load people onto the Zodiac rafts. The sudden appearance of a storm may do the same—weather can turn on a dime on The 7th Continent. Remember that you are venturing into the most remote part of the world. Despite the most modern advances, nature is in control here, and travelers should be prepared to roll with the punches. On our trip, which occurred across parts of the second and third weeks January, we were blessed with overall terrific conditions, with the worst weather being a bit of wind that almost delayed one excursion and gray, cloudy skies on some of the days. This enabled us to make our full 9 excursions across 4.5 days. But the Ocean Diamond’s subsequent trip, which occurred across the week and a half immediately after our return, was notably more impacted by weather, including rougher conditions across the Drake Passage and a storm that forced the ship to start its return back to Argentina half a day earlier—depriving those passengers of their last stop. Beyond the alarmist warnings—which are really meant to frame the vast range of possibilities of an Antarctic experience and are not meant to deter people from taking the plunge—expect a surreal experience of nature in its most pristine form. Rocky peaks, endless glaciers, sculptural icebergs, and a plethora of wildlife. Antarctica is truly unlike any other place on Earth. And it is truly awe-inspiring. Spotting a humpback in Neko Harbor. Although tourists visiting Antarctica will be almost certainly coming by boat, getting to the port of call will most likely require plane travel (again, to Ushuaia or Punta Arenas). Unless you’re living in South America already, this will mostly require a series of flights. Those of us in the United States should plan for a least a full day of travel, in fact, to reach the tip of South America, and given that much of this will take place in the colder, winter months in the northern hemisphere, I highly recommend allotting buffer days to account for potential flight delays, cancellations, and reschedules due to winter weather. The fin of a humpback whale fluking in Neko Harbor. Take my own experience. Coming from Los Angeles, I booked a flight to South America by way of Atlanta. Though I could have done LAX -> ATL -> Buenos Aires, I found an itinerary that would have provided a bonus 9 hours in Santiago, Chile, and booked that instead. Unfortunately, a January snowstorm stranded my friends and me in Atlanta for an entire day, nixing the Santiago bonus credit and bringing us into Buenos Aires a day later than planned. Fortunately, we had planned for three days in Buenos Aires before two days in Ushuaia prior to our cruise departure. However, if we had planned everything to the nth degree and coordinated our arrival into Ushuaia to occur only one day after our Los Angeles departure, the Atlanta delay would have resulted in our missing our cruise entirely! It’s less critical for the return leg back, but if it is possible, I would recommend leaving Ushuaia a day after returning from Antarctica, just to factor in any possible delays. This is less of an issue, since any delays really just postpone your return from vacation (oh darn! ), rather than cut into your Antarctica time. So in the case of my trip, we disembarked the Ocean Diamond at 8am, hung out in town for a couple of hours, then took a taxi to the airport to catch our 1:20pm flight back to Buenos Aires. The still forms of icebergs in Pléneau Bay. When it comes to purchasing airfare for flights down to South America, my limited experience indicated that about four months prior to departure presented the optimal prices. Inside of that, airfares generally crept upward. Of course, keep in mind that traveling to South America in, say, January, would be akin to flying during their peak summer season. Deals will generally be a little more difficult to find. Pléneau Bay, featuring the iceberg graveyard (or gallery). People think of Antarctica as a frigid and unrelenting tundra of icy sharp winds and punishing freeze. And it is—but during the summer season, it’s actually not as bad as most think. In fact, with temperatures sometimes creeping into the low to mid 30’s (Fahrenheit), I compare packing for Antarctica to packing for a skiing or snowboarding trip! I’ll start by what not to pack, and the answer may be surprising. On my trip, I did not bring any sort of heavy winter or ski jacket, nor did I bring any special waterproof boots. That is because these two items were provided to us by Quark Expeditions. The jacket was actually included as part of our payment, and we were able to keep it afterward—a really cool souvenir in my opinion! Quark also provided us with knee-high waterproof muck boots that we wore during our excursions on land and in the Zodiac cruises. 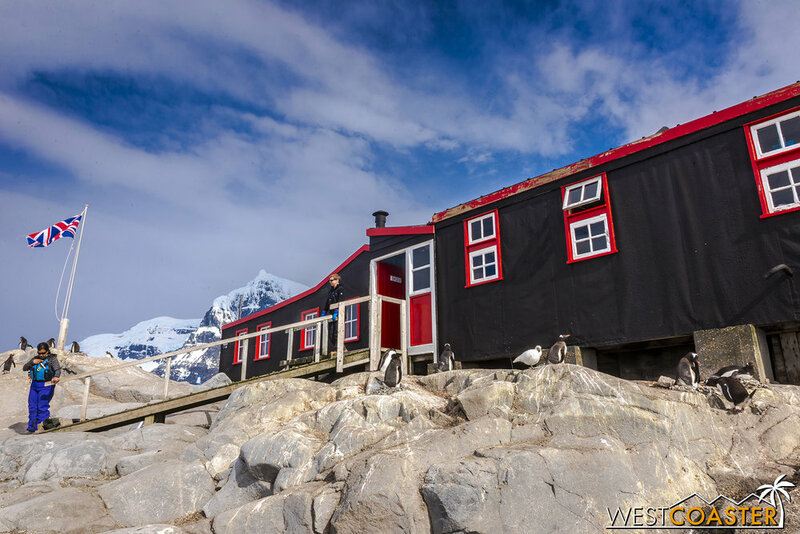 Port Lockroy, home to scientific observation and a historic museum! But the “ski trip” analogy works well for pretty much anything else. You’ll need a pair of waterproof pants (ski/snowboarding pants will do and are what I used) when leaving the ship to go on land or in Zodiac cruises. Having a beanie, earmuffs, scarves, gloves/mittens, and/or balaclava to protect against the wind and the chill are also highly recommended. As with any cold weather locale, layers works best. Underwear, then base layer tops and bottoms, then pants and one or more shirts, then the jacket. Wool socks are a must for their insulating value, and you might even double up on sock layers if your feet get especially cold. Believe it or not, I was able to pack all of my clothes (and toiletries) for my entire trip—which had to factor in the 80°-90°F warmth of Buenos Aires and the 20°-30°F briskness of Antarctica, plus the 50° crispness of Ushuaia—all within a carry-on piece of luggage. What did that include? Optimal rolling and stacking techniques maximized space in my carry-on, and of course, what I wore to the airport helped remove some of the above items from physical space in the suitcase (wearing the jacket, for example, was very helpful). I also brought compression bags, not for the trip to but rather for the return leg to compress items even further and make room for souvenirs. All of this demonstrates that it is all very much possible to pack for Antarctica without taking your closet with you. The museum at Port Lockroy. If you’re going to Antarctica, you’re obviously going to want to document this for posterity. This will vary for different people of different interest levels. For many, and phone and maybe a simple point-and-shoot camera will suffice, as the actual experience plus select snapshots will provide more than sufficient photographic and video memories. Make sure your phone is waterproof (or at least water resistant, since it will get damp on the Zodiac rides if you have it out. Getting a waterproof case or pouch might be helpful to hang onto said phone in case an unexpected bump leads to said smartphone falling into the water. Penguins on a neighboring island at Port Lockroy. (2) DSLR camera bodies—my Nikon D610 and D750. If you’re aiming for some serious photography, you don’t want to be caught with your camera body malfunctioning due to the cold weather or moisture exposure. This proved life-saving for me, because my primary D750 actually did experience functional issues in the middle of my trip, and had I not brought my D610, I would have been without an operating camera for half of the cruise! (4) 64gb SanDisk Extreme Pro SD memory cards. Bring twice as many memory cards as you think you’ll need. I used two of them and a bit of a third. I’m actually really meticulous about deleting bad shots off camera after the fact. In practice, you’ll probably end up firing off continuous bursts of the same scene, which will burn through your images—especially if you shoot in RAW! (1) Nikkor 28-300mm f/3.5-f/5.6 zoom lens. I actually borrowed this from Dan for the trip. A telephoto is a must, and the farther you can zoom, the better. Of course, there are some monster expensive lenses like the Nikkor 600mm f/4 prime (that someone on my cruise actually brought!! ), but a zoom telephoto should suffice. Something reaching at least 300mm is needed to get those nice, up-close portraits of wildlife that you see so often. (1) Nikkor 24-70mm f/2.8 zoom lens. This is my own and what you see the majority of photos posted on Westcoaster taken from. I used this for general shots that didn’t require a super zoom. I didn’t see the need for a super wide angle. Although the landscape is spectacular, the 24mm focal length was almost always more than enough to capture the scene, given that much of the landscape was often far enough away. 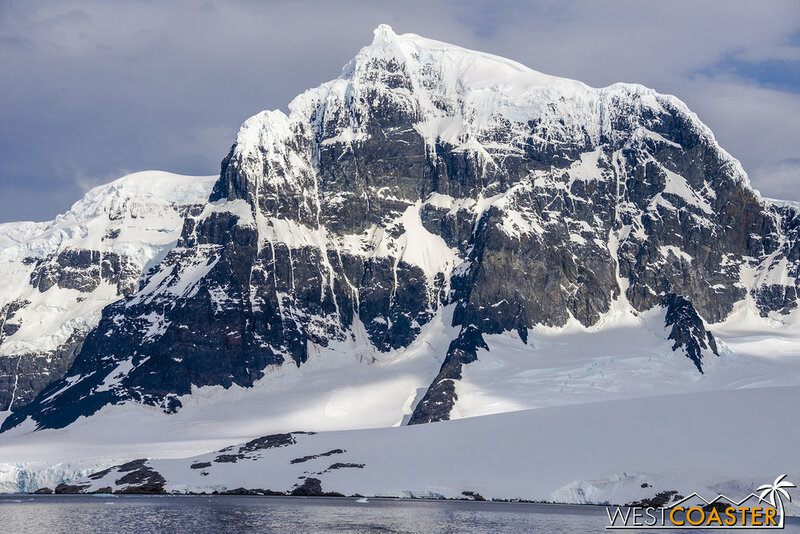 The mighty peaks of the Antarctic landscape are exceptional. In addition to this, I brought my laptop, an external hard drive for backing up files, my iPod (yes, I still use an iPod to listen to music!! ), a power strip, and all required charging adapters and cables. The power outlets on the Ocean Diamond were all configured for American outlets, so I didn’t need any adapters, though I brought the type that worked with Argentina’s outlets anyway because I had to. My friend used the Scopolamine Patch, which is placed on the side of the head behind the ear and worn for up to three days to stifle the effects of nausea, but it does come with certain side effects, and it is also incompatible with Dramamine, so if you do opt for the patch, don’t take Dramamine at the same time (Bonine is fine, though). I also found that the ship itself had free basic medicine for people with typical ailments like headaches, dizziness, and coughs and cold. I actually caught a viral lung infection in the middle of my trip, and the ship’s doctor gave me what basically amounted to a bottle of Robitussin. On the other hand, more specialized drugs like Thera-Flu were not necessarily available, and given that being in a contained space like a cruise ship presented ripe conditions for contagions, I would have packed some of that for the trip if I had anticipated possibly falling ill! A whale flukes in Wilhelmina Bay. You’re on the trip of a lifetime, in the most remote location on Earth. Do not expect internet or phone connections to work on your smart phone. There is most definitely no cellular and data service effective this far south. And they shouldn’t be functional, anyway! You’re on an escape! It’s good to unplug from the world! That said, for those who absolutely have to connect to the internet—either to check and send email, toss up that ‘Gram, or brag on Facebook immediately—the tour operator ought to provide some sort of internet connection plan. Quark did, but it was extremely expensive, quite limited in bandwidth, and also pretty sluggish. There is a ship phone number available for contact in during emergencies only. Phoning out is possible also—but only to notify an emergency contact. During my trip, Quark also provided a daily news brief recap of major international news from several newspaper agencies around the world, for those who wanted to maintain some sort of connection to the outside world and its happenings. But again, it’s Antarctica. Ultimately, connecting to the rest of the world is kind of against the point here. One last look at Antarctica from Wilhelmina Bay. If you have any other questions on Antarctica travel planning, throw them in the comments, and I’ll either answer directly and/or amend this article. And finally, after a veeeeerrrrry long post (longer than I expected, honestly), we are done. We have come to the end of my Antarctica Adventure, and to those of who you who have read along the entire way, I sincerely appreciate your interest. I hope this proves motivational—if not to travel to Antarctica, then to travel somewhere in general, near or far. I hope it inspires a greater appreciation for this amazing planet and its resources, and stirs a desire to advocate for its better treatment. I will make no apologies for preaching about how precious Earth’s interlocked ecosystem is. We only have one, and it is capable of amazing creations and features, but it is also extraordinarily fragile too, and impacts to one part can have wide-ranging consequences elsewhere. In Antarctica, collapsing ice shelves contributing to sea level rise—exacerbated by climate change—pose one example. This isn’t a political stump; it’s scientific fact and observation. And it would be a tragic travesty to lose this pristine and stellar environment to the short-sighted goals of human profiteers. I’m definitely lucky to have been able to witness such a resplendent terrain in person. And thank you for following along!